1. Preheat the oven to 200˚C, gas mark 6. Stack the pastry strips on top of each other and cover with a clean, damp tea towel. Remove the top pastry strip, leaving the others covered, and lay vertically. Place a few pieces of cheese and fig at the top of the strip; scatter over some thyme and season. 2. 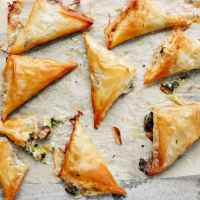 From one of the top corners, diagonally fold over the pastry to enclose the filling, and continue folding to form a neat, triangular parcel. Brush all over with melted butter and place on a baking tray lined with baking parchment.